Come back Bead Soup Party! 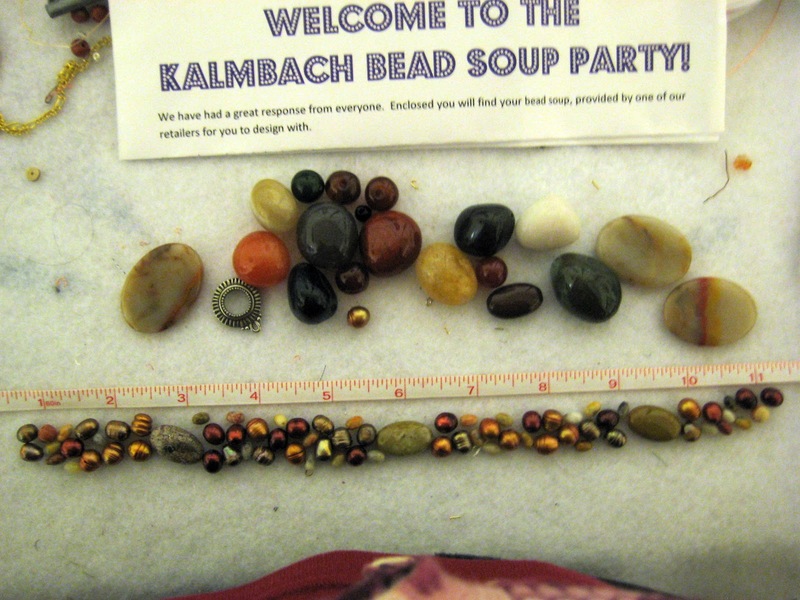 I had join this Bead Soup Party hosted by our beloved Lori Anderson with 400 beaders across the globe. That was in August. 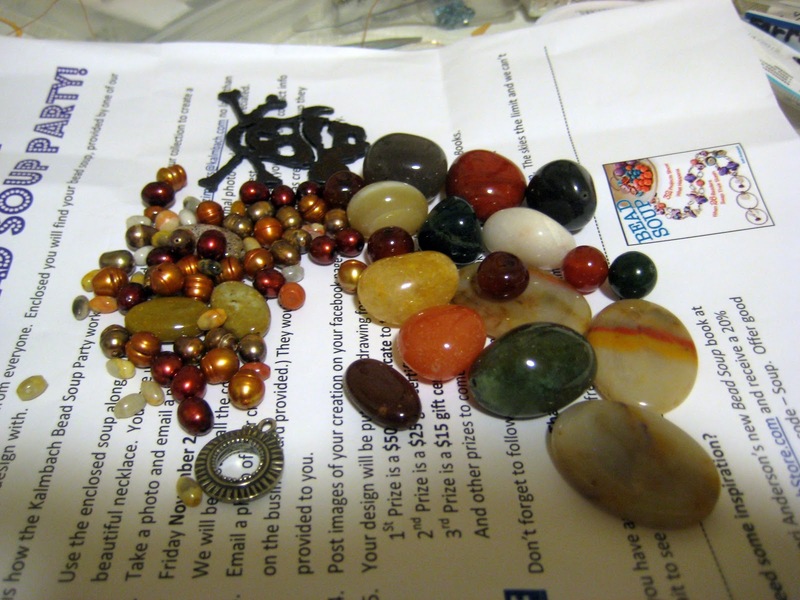 Then as a cherry on the top, a couple of months later I received a packet with some wonderful beads from the Kalmbach store. If you have ever browsed the craft section in a book store or the library you know who they are, you are already well acquainted with the Kalmbach Books. Now I got this packet from a bead store in Lodi, CA named Bunches of Beads. I was so glad to know that they are in California and not that far from where I live. Some day I wish to pay them a surprise visit and buy their awesome beads. For now, my heart felt thanks to them. I bow down to their generosity for sending me this awesome selection. Aren't they awesome? Now there are so many things I can do with them. 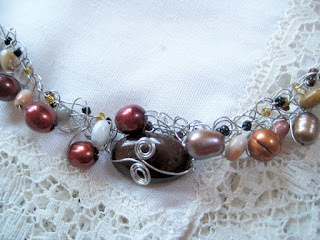 It was tricky in the sense that the beads I chose to wire knit were of different dimension and shapes. 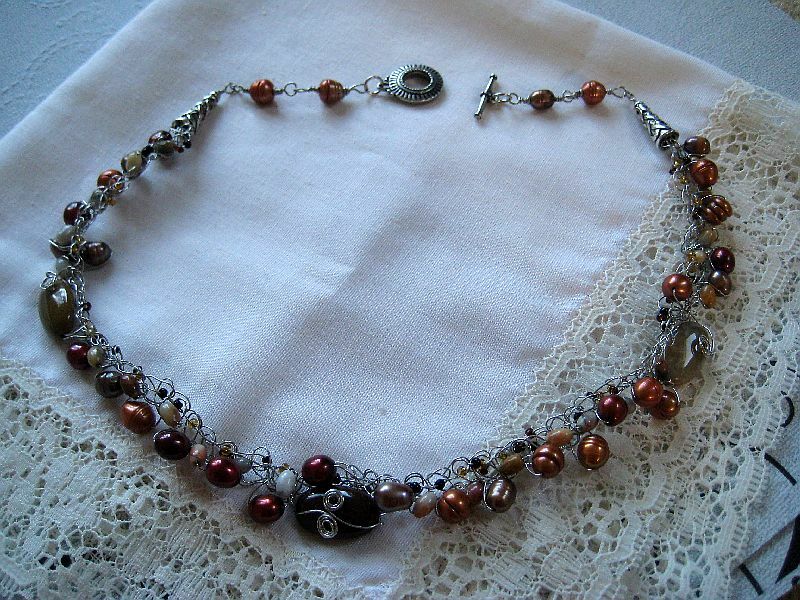 I faced some challenges with three beads, the heavier ones. I wanted them to be secured on top of the delicate lacy knitted wire. So I incorporated some wire work with extra wire . I had never done it before in a knitted wire piece. But I think it was a good solution. What other things could I have done? Do you have some suggestions? But there were still many beads not used. 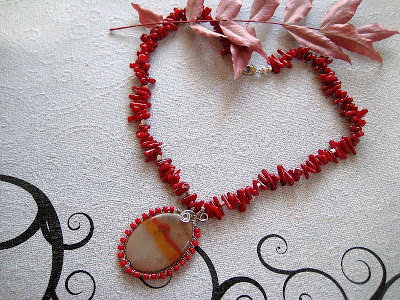 Especially, I was itching to do something with those three beautiful oval agate beads with orange, red, yellow stripes that reminded me of the setting sun. If you are a beader you may want to check out Lori Anderson's new Bead Soup book in your book store or in www.KalmbachStore.com. They have a discount going on now too until 11/9/12. So I am going to go there now. I was very sad yesterday watching the news from the hurricane devastation in the East Coast. Today I am feeling much happy. It's true what Picasso had said - " Art washes away the dirt of every day life"
Some how today I feel hopeful that the sunny days are coming soon and as a nation we will overcome. Both pieces are so beautiful! I haven't tried to wire knit, but it looks so great I just might have to add that to my list of beady things to learn. I really, really love the coral necklace - the colors are so rich! Oh my gosh, all that work! They're both amazing!!! !